Among the truisms in academe is that the excellence of an academic institution depends on the excellence of its faculty. That excellence derives initially from qualifications and capacities inherent in the faculty selected for the institution. Subsequently, it depends upon continued growth in competency. Evergreen has provided the faculty seminar-- a mechanism without equal for such growth. But that alone is not enough. For this reason, we have endeavored collectively and individually to identify various means by which faculty development can be enhanced. Faculty knowing of other possible development mechanisms are encouraged to share their ideas with the deans and provost. The Professional Leaves Policy (see Section 6.100 of the Faculty Handbook) allows faculty to be released from their normal duties to pursue development and improvement in the many ways expected of them. There is a professional travel budget, administered by the budget dean, which is used to enhance the individual faculty member's professional development (Faculty travel whose primary pupose is promotion of the college or representing the college is funded through a separate budget.) Refer to Section 6.200 of the Faculty Handbook. Limited funds are available to help support manuscript preparation for professional publication. Requests for this funding are made through the budget deanâs office. 3. Grants-In-Aid to support an ongoing professional agenda that has already been judged from within and without the college to be of high quality. Typically, sponsored research applications are due in the provostâs office on the last day of the first week of classes during the winter quarter. A faculty committee selected from across disciplines will study the proposals and select the recipients. a. All persons designated as regular members of the faculty or library faculty will be eligible for paid leaves from these research funds. b. There is no relationship between eligibility for professional leaves as described in section 6.100 of the Faculty Handbook and those described as sponsored research. While a person could not hold both leaves simultaneously, they could be held consecutively. c. A person is not eligible for paid leave from sponsored research funds for more than two consecutive years, nor for more than three such leaves in a five year period. d. Paid leave will not be granted for the sole purpose of completing advanced degree requirements. e. It is incumbent upon the applicant to plan her/his leave activities around the collegeâs academic program, taking into consideration her/his particular skills, abilities, and responsibilities in conjunction with the curriculum. f. A period of service following a paid leave will be required upon return from the leave, the period of service being equal to the duration of the leave. Any failure to serve shall require prorata repayment of the monetary value of the paid leave benefit. g. Paid leaves must be taken within the time period for which they are granted. j. Information concerning expected remuneration, if any, from any other source(s). b. Criteria. Thoroughness of proposal, merit of proposed activities, and the extent to which these activities will improve the faculty memberâs professional competence in scholarship at TESC; and the extent of the apparent benefits of the proposed activities to the collegeâs curricular offerings, academic resources or administrative services. Given the size of TESC and the constraints of our staffing patterns, however, it will not be possible to ignore completely the impact of the faculty memberâs absence for leaves proposed during the regular academic year. A report on the previous use of any sponsored research money is required as part of any sponsored research application. Seed grants supported by the research allocation will be of two varieties: 1) "preliminary" awards to support faculty gathering preliminary data needed for a major grant or contract proposal; and 2) "professional agenda" awards to support faculty developing a specific agenda for a long-term professional or research project. The normal range of seed grants will be from $1500-$3000. Awards may be taken in the form of salary in the summertime (or any period in which one is not salaried by the college), equipment, supplies, or in the form of a teaching/research assistant during the academic year. 1. The criteria of eligibility for seed grants are the same as those detailed above for paid leaves funded from the research allocation. 2. Application procedures and deadlines are the same as those detailed above for sponsored research-funded paid leaves. Grants-in-aid of on-going research will be of various sorts, a function of the diverse professional needs of the faculty. Grants-in-aid differ from both paid leaves and seed grants in that they are intended to provide support for professional agenda already in progress rather than proposed or projected activities. The normal range of grants-in-aid will be from $100-$3,000. Grants may not be used for the salary of the principal researcher at any time of the year. Grants may be used for professional assistance, for supplies, goods and services, equipment and travel directly related to the research project (but not to attend professional meetings). 1. The criteria for eligibility are the same as those for sponsored research-funded paid leaves and seed grants with one addition: grants-in-aid will be given only to persons with already developed and ongoing professional agendas or research projects. 2. Applicants for grants-in-aid must present to the selection committee evidence of an ongoing professional activity which has already been reviewed positively by appropriately qualified peers. The nature of the evidence and of the review will understandably vary with the nature of the activity. Examples of appropriate activity include but are not limited to publications; reviewed manuscripts, performances, exhibits; limited lectures to professional societies; commissioned reports or technical papers; and consulting. Examples of positive reviews include but are not limited to published reviews, unpublished peer response, adoption of oneâs work in other settings, and return engagements. There is no single application procedure. The burden is on the applicant to present evidence of an ongoing, positively reviewed professional activity. In addition to that, the applicant should present a brief statement of less than two typed pages specifying the type of aid being requested, its contribution to the ongoing project, the time frame in which assistance would be used, and accurate budgetary information. Recipients of any kind of award from research funds must submit a report to the provost describing the results of the sponsored activity. These reports will also constitute a required part of the application of a person seeking other than first-time award from these funds. A small additional travel fund (equal to 10% of the total faculty professional travel budget) supports faculty traveling at the request of the institution to attend in-state meetings such as the Council of Faculty Representatives, organizational board meetings where faculty are representing Evergreen, conferences sponsored by the Washington Center, etc. To inquire about eligibility for funding in support of such in-state travel, contact the budget dean. Program budgets provide the main source of support for guest speakers and artists, etc. Faculty who wish to bring in a guest speaker and are sharing the expense of the speaker with at least one other program, however, may request support from the budget dean who maintains a small budget to supplement the program budgets for speakers. Contact the budget dean for prior approval. Faculty can often participate in a range of workshops in Olympia (and occasionally elsewhere) either as leaders or participants. Opportunities arise through assessment (contact the director of Institutional Research), the Washington Center (contact the director of the Washington Center), the Labor Center (contact the Labor Center director), the K-12 Center (contact the director of the K-12 Center for Educational Improvement), and other initiatives (contact the academic deans). Summer training in computer software such as Word and Windows has been offered in several years. We expect to repeat this in future years. Watch for announcements on this and other emerging technology workshops. Possibly coming up for next summer: The provost and others have a grant proposal in the works to the National Science Foundation for a Pew Institute-like series of institutes (mini-coordinated studies programs) that focus on the Puget Sound. If the grant is successful, faculty members from Evergreen and various colleges will be invited to participate. Stay tuned for further developments. Each year, the Center sponsors an overnight planning retreat for learning community faculty planning teams in the spring. Itâs a great get-away with good food, no phones or interruptions, and convivial company--other faculty planning teams from around the region. If youâd like to bring your team to do some advance planning, or if youâd like to volunteer to be a "kibitzer" (someone advising a novice team), contact the Washington Center director. Three programs are supported by from royalty funds resulting from a computer education project led by John Cushing when he was director of computing. 1. Equipment Grants. Until all funds are exhausted, annual awards are made for computer equipment and software to support innovative teaching. Applications are requested and reviewed once per year, generally during Winter quarter. Contact Academic Computing for application schedule and detailed information. 2. Plato Lecture Series (Cutting Edge Symposium). An endowed program that supports an annual guest speaker series on a topic concerning computers and technology. Approximately $5,000 is available for each annual series. A call regarding the series is usually issued in late Fall quarter for the following academic year. 3. Staff Development. This program funds faculty and staff training in software applications. Contact the Human Resources Office for more information. The experience of teaching temporarily at another institution has proved very rewarding for numerous Evergreen faculty over the years. Evergreen has a long-standing faculty exchange relationship with Kobe University of Commerce (Kobe, Japan), under which Kobe faculty are assigned to teach at Evergreen during Fall and Winter quarters of each year, and an Evergreen faculty member is assigned to teach at Kobe during Spring and part of Summer quarter. 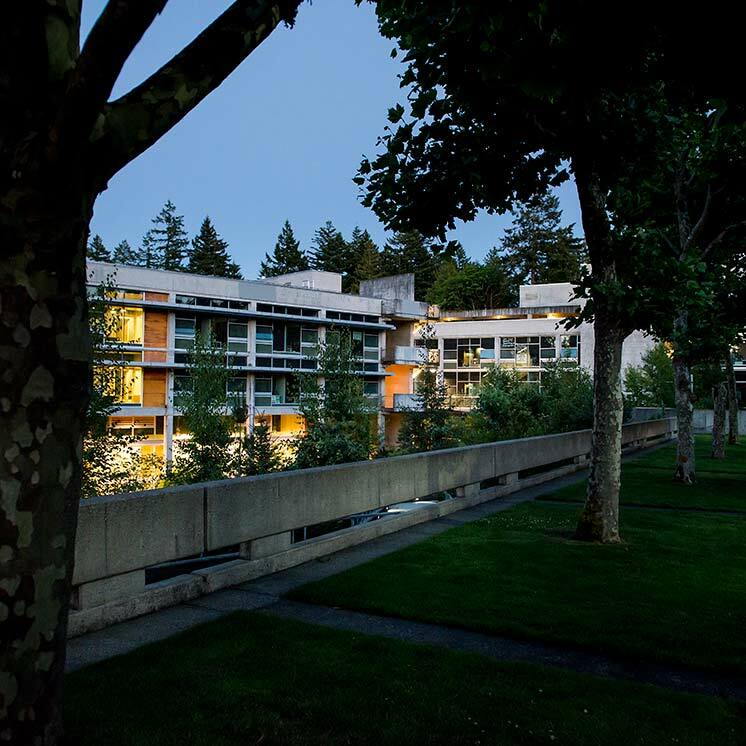 Through its connection with the Washington Center for Improvement of Undergraduate Education, Evergreen has a strong history of arranging one-time exchanges with other institutions in Washington, and with a number of colleges in the rest of the country. Typically, during the faculty exchange, both faculty members remain contractual employees of their home institutions, assigned to teach for a short period (one quarter to one year) at the host institution. A variety of arrangements for accommodation have occurred. Setting up an exchange requires coordination of a number of critical factors, including teaching assignment, calendar, and support. In most cases, these are one-time, not routine arrangements, and obstacles can appear at both ends. Interested faculty should consult the Academic Dean for Faculty Development to learn of exchanges currently under way or to initiate contact with potential hosts. In addition, there are important on-campus opportunities for faculty to work temporarily in different roles: 1) one or two quarter assignment as a member of the Library Reference group; and 2) one or two year assignment as a full-time Academic Advisor. Again, consult with the faculty development dean for information. Note: the expectation is that faculty members will have served a minimum of five years full-time teaching before becoming eligible for exchanges and rotations. Contact the Washington Center director for information about the Washington Centers extensive print materials on teaching and learning in collaborative environments or for kibitzers/consultants on selected topics. Approximately $40,000 per year is currently (1996) allocated from the academic area budget to support short summer study sessions for groups of faculty. Typically lasting a week or so, these institutes have generally emphasized topics which promote contact between faculty across subject areas and career stages. For example, the 1996 round included two sessions on World Wide Web publishing, one on teaching writing across the curriculum, two on seminar teaching, and one on teaching through structured small-group exercises. Faculty participants are paid a modest daily stipend. The number of institutes offered and the number of faculty served by them depend on the actual allocation in a given year and the expenses of the institutes above and beyond the participants' stipends. Each year, the academic dean responsible for faculty development will circulate a list of proposed topics and a call for further suggestions, as part of settling on the next summer's slate of institutions. In addition, Evergreen has had success in soliciting grant support for further institutes connected with teaching and learning projects of various kinds, such as the 1993-95 grant from the National Science Foundation's Undergraduate Faculty Enhancement program, which sponsored science-related curriculum dissemination for Evergreen faculty and others from the Western states. The availability of summer study of this sort depends on the vagaries of the grant process, so it cannot be guaranteed, but it has provided significant development experience to a fairly large number of faculty over the years, and faculty should be aware of it as a distinct possibility for the future. If you have an idea for professional development that is not on this list, contact any of the academic deans. They will see if they can turn it into a reality.